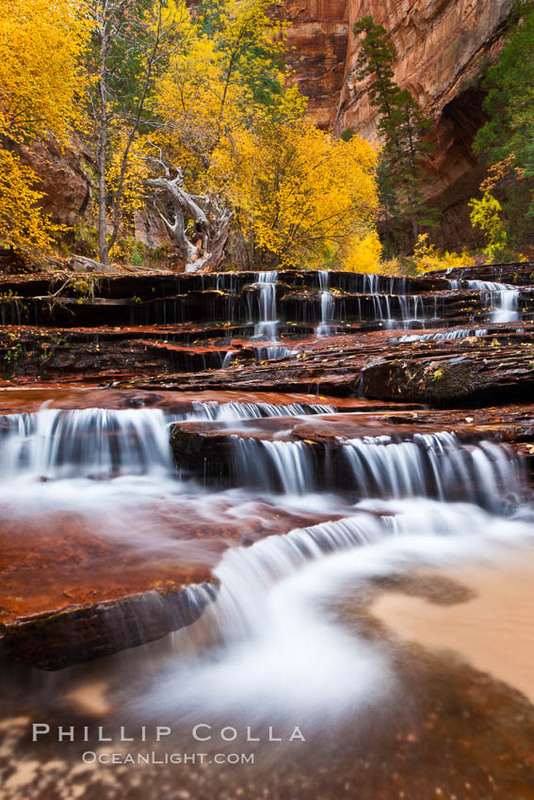 Archangel Falls is located a few hundred yards before and below the Subway, in Zion National Park, Utah. Our hike to the Subway took us past a number of small cascades. Most of them would be hard to categorize as waterfalls, but Archangel Falls (or is it Arch Angel Falls?) is large enough that I’ll call it a waterfall. Beautiful red rock slabs, with autumn trees and colorful falling leaves, all surrounded by the distinctive towering cliffs of one of Zion National Park’s narrow canyons. Archangel Falls in autumn, near the Subway in North Creek Canyon, with maples and cottonwoods turning fall colors.